Wow, I never realized! Too bad about it being even more over-sized. Huh. I guess there was so much coming out towards the end, and my only source of what was coming out was really what I saw in stores and the occasional mention in a magazine. I didn't realize they had made a Laser Pistol from The Cage until I saw it on Ebay not long ago. The Playmates portion of the NFC site has everything old that came out. Not the best pictures in the world, BUT....that will be changing for sure. Hmmm...thought I read that Galoob planned the second year of toys, but retailers had only allocated shelf space for micro machines that year so the figures were cancelled. I wouldn't say Galoob weren't invested in the line when they had that amazing bride playset planned! That would have been soo cool. I recall there was a retailer who ended up with so many Riker figures that they drew beards on them & sold them as Season 2 versions! Right, it was ....... um.......... dang, I'm getting old. They even started giving them away with an order. Asked the folks on Playtrek. They said the company who did the season 2 Rikers was The Intergalactic Trading Co. According to resident Trek expert Ian McLean, the Galoob figures sold quite well. The problem was Riker. Rikers everywhere! 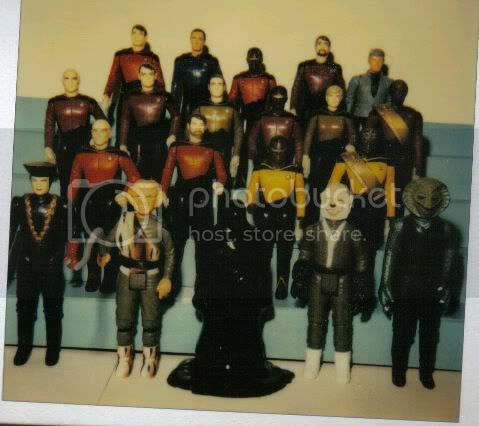 soo many Rikers left on pegs that the second wave (all Aliens) was only produced in small numbers & retailers did not order any more figures after that as Riker was still around. That's the problem with heavy packing the 'popular' characters. No Harry Potter lines seem to last long because Harry himself is so overpacked in boxes stores cannot get rid of them. I found the die-cast Enterprise and the main characters ie main crew Picard, Riker, Data, Geordi and Worf. Found the Selay and Antican at a sci-fi collector shop year later. Still on card without their soft goods cloaks. Interests:Collecting 1/18 scale action figures: Star Trek, sci fi, and superheroes- Warhammer. It is funny now that there were so many Rikers then. "A fist full of Rikers." Hahahahahaha. You can take the Riker, paint a beard on him, and paint the shirt yellow to have the Thomas Riker clone. Paint Picard blue for the Tapestry version, and Worf went from red to yellow after Yar died, as did Geordie. I always tried to keep an original even though the colors were too dark. I think that may have been another problem with the line, the colors were not accurate. There is also a Borg pvc that is the right scale and looks good with them. If you get multipules, you can make alcoves for them and have the crew invade the Borg ship. Those look nice! I love the steps you have them displayed on! Where did you get it? I always loved the Galoob figures, they weren't all BAD! Their bodies looked a lot like the actors shape and size. Made it from museum board, not really that hard to do, just not very durable when you keep packing and unpacking it. Holy crap I remember them. Back in the day when I lived in Indiana I would order stuff from them. I have one of those inflatable Enterprise D's. It's bloody huge! Interests:Star Wars, Star Trek, indiana jones and DC superheroes. I remember the catalog pages for the bridge. That was to be an Awsome playset. I found the entire crew at kaybees in the early 90's on clearance for 1.99. I am on the lookout for the aliens if anyone has any extras. I loved this line. Was a child of the vintage Star Wars era and I just love that scale. I have always been fond of these little guys. I still have the main crew that was released but never got around to getting the aliens. I like how they were all in scale to each other but was never crazy about the 90 degree bend in the one arm. I wish they would have made a few more. Intergalactic Trading was my go to order place back in the day. I still remember the catalogs I'd get in the mail from them. It was that dark paper and always had the dragon on the cover. I too remember those catalogs.